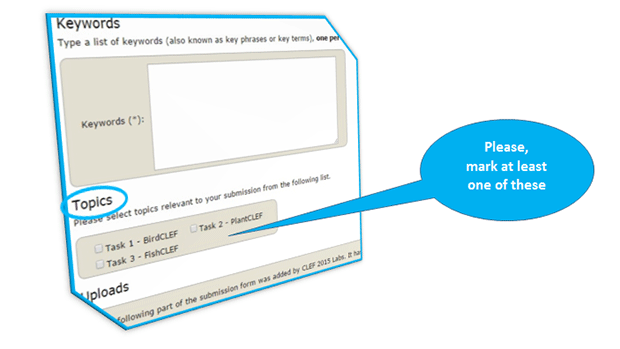 As in 2014, The CLEF 2015 Labs working notes will be published in the CEUR-WS.org proceedings. The electronic Working Notes will be organised according to the Labs. If one group participates in more than one Lab, separate reports are to be submitted. Moreover, for those Labs that are subdivided in several tasks, separate reports for different task(s) are to be provided. When the author logs into easychair they will find a separate "Easychair Track" for each CLEF Lab and once they have selected the correct "Easychair Track" for their, as in the figure below. For each of the tasks in which they participated, groups are requested to submit a report describing their experiments. After the review process, if the paper will have been accepted, authors will be requested to submit the Camera-Ready Version of the paper, according to the reviewers' recommendations. PDF file with the scanned and signed copyright agreement (otherwise, the submission will not be published in the final working notes). Submission of papers is to be done electronically through the Easychair system. Authors must log in using their own username and password. If you don't already have an Easychair account, you will find the instructions to obtain one on the same page. 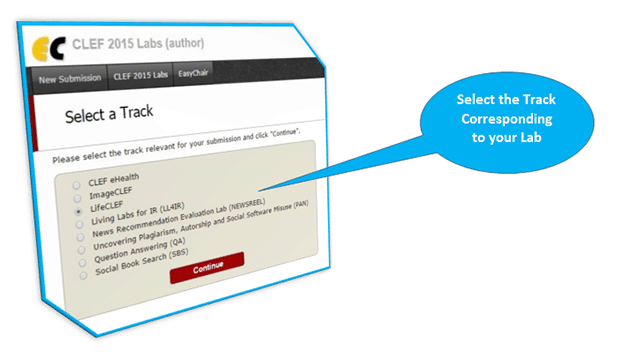 Once you have logged in, click on "New Submission", select the correct Lab/Track and Group/Task and then follow the instructions to submit your paper. Working Notes Papers due 7th June 2015 11:59 pm - midnight - Central European Summer Time. This is a STRICT DEADLINE. CEUR-WS Camera Ready Working Notes Papers due 15th July 2015, 11:59 pm - midnight - Central European Summer Time. This is a STRICT DEADLINE. During the upload of the Camera-Ready version of the accepted papers, a scanned and signed version of the CLEF copyright form must be uploaded with the source and PDF files of the submission (otherwise the submission will not be published in the final working notes). The paper should not exceed 12 pages (but as they are published only electronically, the length is not too important).